We’ve come full circle. Once upon a time we had no choice but to hit the roads to uncover our family history. Then the Internet came along and we seemed content to search for our ancestors from behind our laptops. Now, we have been re-inspired with shows like Who Do You Think You Are? to move away from our desks and once again look to travel to walk in our ancestor’s footsteps. It’s become very apparent you just can’t replace that experience with viewing a document online. Because of our interest in combining genealogy with travel, there are a growing number of agencies who are now willing to help travellers plan that perfect heritage or genealogical vacation. A genealogy adventure can be expensive. For many it might be a once in a lifetime opportunity. All the more reason to do it right and invest a little time in deciding how you plan to tour your ancestral homeland. First, let’s understand the difference between genealogical vacations and heritage vacations. Many people who seek a heritage vacation want to visit the country or hometown of their ancestors, get a sense of the history, enjoy the culture and food. However, a genealogical trip goes a little deeper. While all the fair and flavour are still important, this traveller also wants to include visits to archives, churches, and cemeteries, maybe locating a house and property and perhaps even finding distant relatives. They are looking for the full Who Do You Think You Are? experience. Travel companies and guides can help you achieve this experience. Identify which type family history vacation you are looking for and seek out the travel agency that can help you plan your trip. Genealogical or heritage vacations are not cheap, that’s why we did an entire post on money-saving tips and creating a vacation budget. While you are perfectly entitled to plan your own trip and be your own tour guide, it can be difficult if you've never visited the area before and it may not be the best use of your time. Enlisting the help of a travel or tour agency is a crucial investment in your genealogy dream vacation. There are essentially three options available to you when it comes to choosing a travel agency or guide. Hire a travel company that offers heritage or genealogical vacations. Hire a genealogy travel company, they specialize only in genealogy tours. 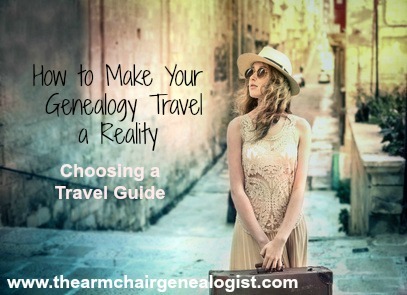 Hire a genealogist very familar with your destination, or local to the area, one who offers travel and tour services and who can plan a very specific experience for you. With the first two options, you may wish to be part of a larger group reducing your costs, however, your trip will be more general in nature. A larger group doesn't want to visit your families homestead. If you book a private tour geared specifically to your needs, you'll get more flexibility but keep in mind the smaller the group, the more precise the tour, the higher the price tag. The third option is to hire a local genealogist or a genealogist familar with your ancestral homeland. You can create a very unique and personal trip by taking this route. Consider hiring a driver, along with a genealogist, together you get the all conveniences and stress-free travelling of a larger tour but a more personal and customized vacation. How do you find a genealogist tour guide? The Association of Professional Genealogists lists a number of genealogists who offer travel and tour services. For instance, Christine Woodcock offers genealogy tours of Scotland, Mary Tedesco offers tours of Italy, and Megan Smolenyak Smolenyak author of Hey, America, Your Roots are Showing and Who Do You Think You Are? fame offers travel and tour services as well. If you prefer to go with a travel agency, then there are a number companies who can help you plan your genealogy or heritage vacation. We've listed a few below to help you get your genealogy travel plans underway. Roots to Routes - is an internationally-known firm with offices in Ukraine and Poland. They specialize in Jewish research in the archives of Eastern Europe. They will visit ancestral towns on your behalf or can arrange a customized visit for you and your family. At present, they specialize in trips to the UK, Scotland, Ireland and Wales. Other countries are available on request. Rootsbound Travel - helps make that dream come true by providing ancestral travel services that are personal, unique and focused. Using the information that you provide about your ancestor they will create a personalized unique trip of 7 to 10 days with an emphasis on the cultural and historical points of interest to be visited. They will also book your travel and lodging and provide maps and historical background for the area being visited. Family Tree Tours -provides group heritage tours, private genealogy tours, or independent heritage trips. They specialize in German tours but can provide trips to European destinations. Ancestral Attic – offers escorted custom private Poland genealogy tours along with private escorted Eastern European holiday and heritage tours. Clans and Castles – is a specialist tour operator, arranging self-drive tours for clients. Specialties are Scottish castles holidays, vacations focusing on clan lands. They will arrange a tour guide for your trip if you prefer not to drive yourself. Norwegian Adventures - offers a very special service of genealogy research and heritage travel in Norway. For those who are not only interested in exploring the beauty of Norway, but also are of Scandinavian ancestry, they offer to find your roots and take you there. Time Travel Tours – leads in-depth, focused tours of Ireland for the purpose of research, family history and genealogy. My Irish Connections- can arrange to transport and accompany an individual, a family or a small group on a genealogical tour. They can prepare an individual itinerary which can be specially tailored to allow visits to appropriate record offices to undertake research and visit places of family interest, such as homes, churches, schools, and graveyards. Ancestors in Europe- will help you get up-close and personal with your European heritage by visiting the towns and villages of your family's ancestry. Using your genealogy research, they will create and organize an unforgettable privately guided itinerary for you and your loved ones. In addition to visiting places particular to your family tree, they will consult with you to incorporate a variety of other destinations, activities and points of interest. Take some time up front to identify just what you are looking for in a genealogy dream vacation and then find a travel agency or genealogist that will best match your needs and budget. Have you taken a genealogy dream vacation? What advice do you have for our readers?